Posted On January 16, 2012 by &filed under Legal Articles. The year 2012 has begun with catastrophic affect for the rupee. It was Rupees 43.96 against a dollar in the July 2011 and now for $1 it is Rupees 54.3. Rupee hits all time low in January 2012. This kind of decline will have the sweeping impact on the macro economy of the country, as we are heavily dependent on the import of oil, food items and other crucial raw materials. Devaluation means officially lowering the value of currency in terms of foreign currencies. There could be many motives of the devaluation. It stimulates exports of commodities. It restricts import demand for goods and services. It helps in creating a favourable balance of payments. Almost all the countries of the world have devalued their currencies at one time or the other with a view to achieving certain economic objectives. During the great depression of 1930 devaluation was carried by most countries of the world for the correcting their over-valuation. In early controlled exchange rate regime, the rupee exchange rate hovered around Rs 4.00 in the 1950s, Rs 5.00 in the 60s, Rs 7.00 in the 70s, and Rs 8.00 in the 80s. In the liberalised era of 90s, the rupee moved to Rs 20s and Rs 40 in the next decade of 2000. During this period, the Government has declared two major devaluations. The rupee was devalued first in 1966 by 57% from Rs 4.76 to Rs 7.50 against the US dollar. In the 90s, the rupee was again devalued by 19.5% from Rs 20.5 to Rs 24.5 against the US dollar. Since 1951, despite government attempts to obtain a positive trade balance, India experienced a severe balance of payments deficits. Inflation caused Indian prices to go sky high. When the exchange rate is fixed and a country experiences high inflation relative to other countries, that country’s goods become more expensive and foreign goods become cheaper. Therefore, inflation tends to increase imports and decrease exports. Since 1950, Indian continuously faced trade deficits. Another reason, which played important role in the 1966 devaluation was war with Pakistan. The US and other countries withdrew their aid, which further necessitated devaluation. 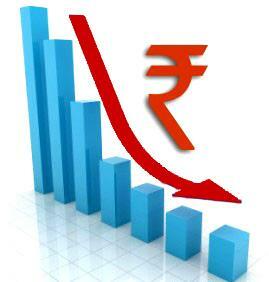 To improve fiscal position, Government of India devalued Rupee by whopping 57% against Dollar. In 1991, India still had a fixed exchange rate system, where the rupee was hooked to basket of currencies of major trading partner countries. At the end of 1990, the Government of India found itself in serious economic trouble. The government was close to financial default and its foreign exchange reserves had dried up to the point that India could barely finance three weeks of imports. In July of 1991 the Indian government devalued the rupee by 19.5%. The government also changed its trade policy from its highly restrictive form to a system which allowed exporters to import 30% of the value of their exports. Inflation rates in India have risen about 8.50% amid concerns surrounding the devaluation of the rupee and the erosion of the purchasing power of savings. In spite of Governmental interventions, the rupee is in a free-fall, having slipped by over 20%, making it one of the most awful performing currency globally. RBI made thirteen rate increases attempts to docile the inflation in last one year but hardly achieved any significant result. Inflation rate maintained upwards trend. This is now reflected through the currency depreciation. Inflation directly enhances prices and thereby affects the purchasing power of currency. Currency value and inflation have a direct co- relation and impact each other. The currency re-valuation is also essential with the change in domestic prices affected by inflationary forces. Currency is considered to be over valued if the suitable adjustment is not made with the price index fluctuations. India currency devaluation has also resulted in surge of import by over 200% of gold and silver. Statistics show that imports of gold and silver to India were $8.96 billion a growth of 222%. The Reserve Bank of India purchased 200 tonnes of gold from the International Monetary Fund in 2009. From the start of 2011, some 30 banks in India have been granted permission to import gold and silver. Further gold purchases are expected in coming months, as the Reserve Bank has issued licenses to seven more banks to import gold and silver. Indian banks are therefore contributing to the massive increase in demand for gold and silver. Chinese banks are also catering to the increased demand of Chinese people for gold bullion for investment and savings purposes. In fact, most of the world’s central banks are now diversifying from major currencies such as the dollar and euro into gold. In addition to India and China, these countries include Russia, Sri Lanka, Bangladesh, Mauritius, Mexico, Iran and Saudi Arabia. Financial experts believe, the increased demand for gold and silver from India and wider Asia is sustainable and that it will keep the precious metal market thriving. As a result of de- valuation, Indian stock markets will face new threats. The operators and participants were earlier concerned about domestic inflation rate and the Reserve Bank of India’s economic policies. But the fall in the value of Indian currency has taken aback all concerned. The investors are bound to suffer as there is always a positive correlation between stock index and corporate results. 1. Inflation: Firstly, the descend, in the rupee was assumed to have taken place to adjust for the high inflation. But, as the rupee continued to go down, apprehensions of further increase in the inflation have appeared. 2. Strengthening of Dollars: Increase in global dollar value can also be attributed as one of the prime reason for the fall in the value of rupee. The demand of dollars due to economic crisis in other countries including Europe has also tremendously increased the dollar demand. The Euro-Zone crisis has weakened the Euro significantly against the US Dollar. In other words dollar is getting stronger in the world markets. Obviously the investors are considering US as safe place to invest in. There was also an increased demand for the dollar in the domestic currency markets due to a flight of foreign funds from the domestic stock markets. 3. Dollar Demand from Stock Markets: Foreign institutional investor’s withdrawal from domestic economy is the one big reason for this depreciation. The Greece Crisis and its rescue package made investor to re-think about their investments. Certain political changes and civil movements are also the factors for foreign institutional investors to become net sellers recently. 4. Fiscal Deficit: The growing trade deficit and large fiscal deficit are also contributing to the fall in the rupee valuations. According to the Government, the reason for the current round of rupee depreciation is related more to current grim global economic environment. The currency of every other emerging economy (barring China that managed its currency peg against the US dollar) is falling. The currencies of Russia, Brazil, South Korea, and Indonesia have plunged by between 6% to 16%. So the 10% fall in the value of rupee against the US dollar is hardly out of context. The sovereign debt woes of European Union are shifting foreign investors from euro assets to dollar assets. There seems to be no other alternative to US dollar. RBI is concerned and keeping close watch on the situation. Apart from direct intervention in the currency markets, RBI has taken many other measures such as relaxing external commercial borrowing norms by raising the ceiling on interest rates. It has also increased the interest rate cap on foreign currency deposits. The RBI has removed the USD 100 million cap on net foreign exchange supply arising out of rupee swap transactions that banks undertake on behalf of customers. In order to attract more foreign currency deposits, the RBI has raised the interest rate ceiling. The spreads for NRE term deposits were increased from 1.75% to 2.75% while those on FCNR (B) deposits were increased from 1% to 1.25 %. The wide-ranging perception in the financial market is that until the global macroeconomic environment settles, the rupee will continue to be under pressure. “India’s external position has become increasingly vulnerable to global risk appetite. Further weakness cannot be ruled out,” Royal Bank of Scotland said in a research note. The rupee is down 14.80% on the year, with the closest loser among other Asian units being the Thai baht, which has shed just 3.2%, followed by the Malaysian ringgit that is down 3%. The rupee’s slither may continue due to the decline in foreign exchange inflows and swelling outflows. The Euro zone, the world’s largest trading block and India’s biggest trading partner, is also in a deep crisis. In times to come, this zone has to stabilise to bring some semblance of order to the global currency markets. Numbers of Indian scams have also distracted government’s concentration away from economy. These scams make the bad image of India in the global market. At the end of G-20 summit in Seoul recently, world leaders declared (in the backdrop of the US demanding that Chinese currency Yuan should be appreciated to check the Asian giant from taking advantage in international trade) “We will move towards more market determined exchange rate system and enhance exchange rate flexibility to reflect underlying economic fundamentals and refrain from competitive devaluation of currencies. Advanced economies including those with reserve currencies will be vigilant against excess volatility and disorderly movement in exchange rates”. Attending a meet in Seoul PM, Dr. Manmohan Singh agreed to refrain from “competitive devaluation” and bring in exchange rate flexibility to ensure that no country gets undue advantage. What Indian Government Can do, to Bring back Positive Vibrations in Indian Economy? 1. Allow free flow of foreign investment for the development of infrastructure and manufacturing sector. 2. Restrain / discourage import of non essential and luxury items e.g. auto sector imports. 3. Interest rates may be increased further on NRE and FCNR accounts. 4. Restrain /discourage export of agricultural produce and basic minerals e.g. iron ore.
6. Promote migration of skilled personnel / work force from India. We have them in plenty. 7. Facilitate the voluntary return of the funds parked outside India. 8. Reduce / cut unnecessarily expenditure of government institutions e.g. Indian Embassies. Ask them to repatriate their surplus fund instead of calling funds from India. Many foreign embassies in India are remitting their surplus to their home countries. 9. Government should observe restraint in offering financial aid to other countries. We are yet not so rich. Our people are still hungry and need night shelters.